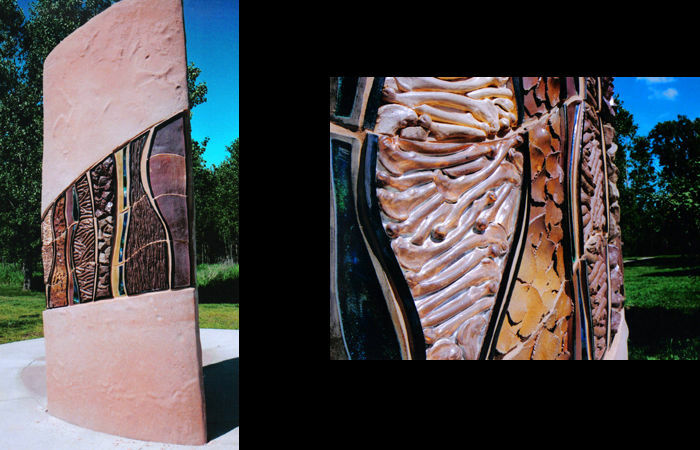 Pod Forms as Icon, purchased for permanent installation at the Overland Park Community Center, Overland Park, KS, 2009. O! My Spiky O!, commissioned by the Alegent Health and the Bemis Center for Contemporary Arts as part of the O! Project, 2007. Currently located at 144th and Center St. in Omaha. Tile mosaic, six 16 x 16” inlays, created using tile made with summer camp kids for bathhouse at Pioneer Park, Billings, MT, 2005. Recaptured, 5’x 6’ tile mural, for Boyer Chute National Wildlife Refuge as part of the Lewis and Clark Icon Project, Omaha, NE, 2004. 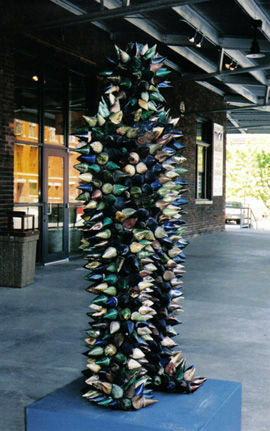 Spikey Doe, 6’ tall outdoor sculpture covered with clay spikes for the J. Doe Public Art Exposure Project, Omaha, NE, 2001.